The BENCHMARK MAP COMPANY produces atlases for some selected states. Benchmark atlases are unique in their use of two map formats to represent a variety of information. The "Landscape" map section features elevation tinted shaded relief mapping which shows the mountain and valley landforms very clearly. Major roads and backroads are shown in this part of the atlas, and the bold print makes them stand out on the page for ease in navigation. 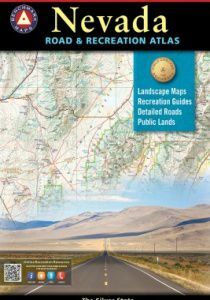 The "Public Lands" or "Recreation" section of the atlas utilizes color coding to depict political designations such as state land, wilderness, U.S. Forest Service land, BLM land, Indian lands, State Parks, National Parks and others. This is also a very good resource for viewing the Game Management Units as their borders and designation numbers are shown in this section. Other information compiled in the Benchmark atlases are listings for Campgrounds, RV Parks, Scenic Attractions, Boat Launches, Hunting and Fishing information, Golf Courses, US Forest Service Office locations, BLM Office locations, as well as a comprehensive index to city and town locations. This NEVADA State atlas has 96 total pages. The scale of the Landscape maps is 1:280,000 which equates to about 1"= 4.5 miles. The scale of the Public lands map is 1:850,000. The Lake Tahoe area is at a scale of 1:185,000.